Apple reached the $900 billion mark in November last year and Amazon was at the fourth spot with $546.5 billion market cap. 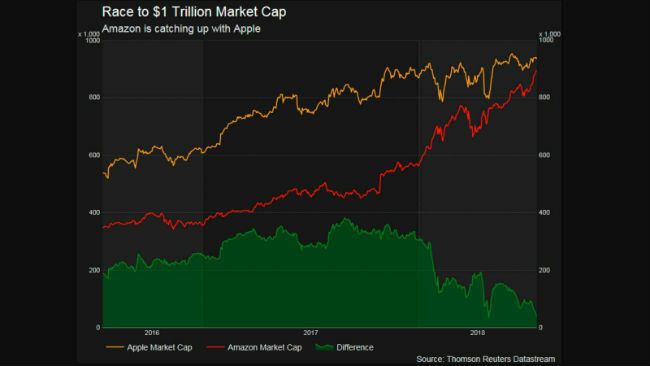 Apple is currently pegged at $936.87 billion and Amazon is shortening the gap with current market cap of $902.89 billion. Apple has always been a front-runner when it comes to being the first tech company to reach a trillion dollar valuation. When Apple CEO Tim Cook took the stage to announce new software for its different software products at the annual WorldWide Developers Conference (WWDC) in June this year, its stock reached an all-time high to $193.32, putting the company’s market cap just over $950 billion. Now Amazon, which has become a force to reckon with in the last few months, is closing the gap and looks to become the first tech company to reach a trillion dollar mark if it continues to grow at a pace it is growing now. 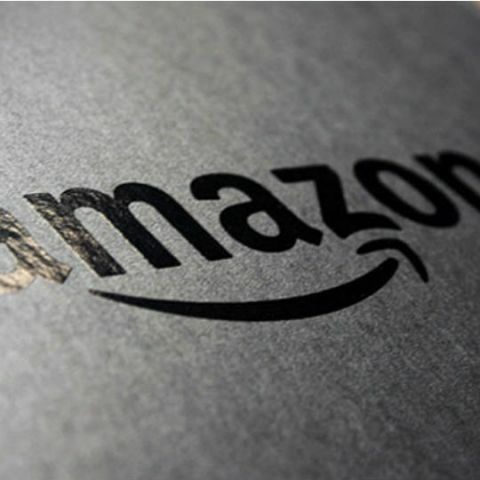 Thanks to the Prime Day sale, Amazon sold over $100 million worth of products and on Wednesday, the company’s stock market value reached $900 billion for the first time since it went public 21 years ago. According to a report, the company’s stock has climbed by 57 percent since January. “An investor who bought 100 shares for $1800 in the 1997 IPO would today be sitting on more than $2.2M.” To get a better understanding of the gravity of the subject, let’s see some facts. Apple reached the $900 billion mark in November last year. At that time, Google’s parent company Alphabet was the closest competitor with $728.6 billion valuation, followed by Microsoft at the third spot with $651.5 billion cap. Amazon was hanging at the fourth spot with only $546.5 billion market cap. Nine month later, Apple could only reach $950 billion valuation (current $936.87 billion) and Amazon leapfrogged Microsoft (current $828.82 billion) and Alphabet (current $838.15 billion) to touch the mark that only Apple has crossed. The current market cap of Amazon is $902.89 billion. Can India help Apple touch the magic number? Although Apple India is undergoing a transition period with three country executives already quit, the bigger picture implies that India could play an important role in helping the Cupertino-based company reach the trillion mark which it has been slowly, but steadily, crawling towards since last year. The company wants to rejig its iPhone sales strategy in the country where it has a market share of about 2 percent. The company has sold just 3.2 million iPhones in 2017 and in the first half of 2018, fewer than a million devices have been moved. Apple, along with OnePlus and Samsung, is one of the top contributors in the Indian premium smartphone segment which grew 20 percent annually by volume and 28 percent by value in 2017 (Counterpoint Research). 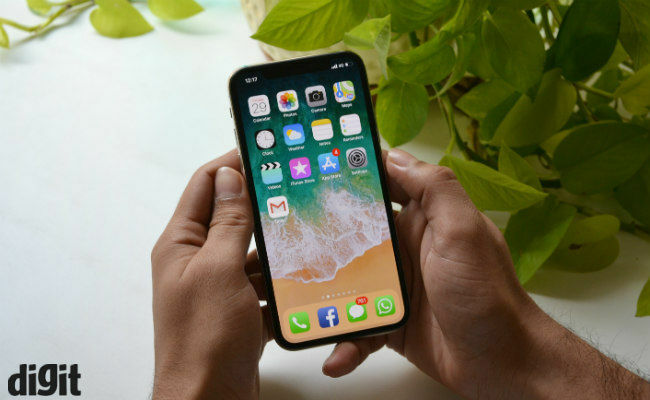 It led the premium segment, capturing 47 percent share during the fourth quarter of 2017 and 38 percent during calendar year 2017, driven by strong shipments of IPhone X and iPhone 7. In May, Apple posted a healthy revenue of $61.1 billion for its fiscal 2018 second quarter and the company's CEO Tim Cook said he will now put great energy into the growing Indian market. During the company's earnings call with media, Cook said: "Let me start with India, and then I'll talk more about China. India, we set a new first-half record. So we continue to put great energy there... Our objective over time is to go in there with all of our different initiatives from retail and everything else. And so we're working toward those things. It's a huge market and it's clear that many people will be moving into the middle class over time, as we've seen in other countries." Will Apple or Amazon be the first company ever to hit a trillion mark? The simple answer is ‘No’. Apple or Amazon will not be the first publicly traded company to reach a trillion dollars in market value. Oil and gas producer PetroChina has topped $1 trillion (briefly) on the Shanghai Stock Exchange in 2007. Apple also would not be the most valuable company in the world. Experts believe that Saudi Arabia government-owned oil giant Aramco could make a $2 trillion IPO soon. In January, the company was worth $1.5 trillion. However when considering which of the tech comapnies would hit the trillion dollar evaluation first, it is a very close race between two very capable entities.